Sri Lankan ODI skipper Upul Tharanga advised his batsmen not to throw their wickets away easily and to bat more responsibly in view of the crushing loss against India in the ODI series opener on Sunday. 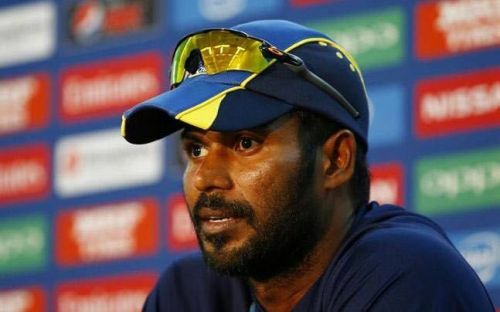 Tharanga was speaking to the media ahead of the second ODI on Thursday and said that it was vital that one or two of the team's top-order batsmen to score big in order to ensure a good total for the side. "To get to a big total we need the top four batsmen to fire. One or two of them must make a big score. If a player gets a century then we can put up a good total between 280-300," Tharanga said at the pre-match press conference. "What I expect from the batsmen is once they have settled in, they should bat the entire innings and take us to a decent total. If you look at the past results we have been in good positions in the first 20-25 overs. From there onwards only we have lost the grip as batsmen played irresponsible shots," said the skipper. Tharanga also backed Lasith Malinga to return to his best sooner rather than later and also believes that his mere presence in the team will help the young fast bowlers in the side. "Every cricketer goes through this phase. He has returned to ODI cricket after being out for about 18 months. But since his return, he has been unable to produce those match winning performances mainly because catches have been dropped off his bowling. "But his presence in the team is a big boon to the young fast bowlers who can learn a lot from him," he said. Sri Lanka has been on a terrible run of form having lost the ODI series at home against minnows Zimbabwe and started off on a disappointing note in the five-match series against India, losing by nine wickets on Sunday. While the hosts made a good start at Dambulla, progressing to 139 for the loss of one wicket, a batting collapse saw them lose their last nine wickets for just 77 runs and were all out for 216; a target India achieved easily with more than 20 overs to spare. The performance of the Sri Lankan batsmen left a lot to be desired and Tharanga made no bones about what he thought of the batting debacle at Dambulla. He is hopeful that the batsmen will be more careful about their shot selection and wants them to aim for a big knock rather than being happy about a good start. Despite the loss, Tharanga maintained that the side is in good spirits and also downplayed any indication of an unrest, which was reported following Test skipper Dinesh Chandimal's exclusion from the playing eleven on Sunday. Tharanga urged the team's fans to continue supporting the side and is confident of a turnaround in fortunes soon. Both Sri Lanka and India have remained tight-lipped about their selection for the second ODI which will be played at Pallekelle, though both teams are expected to make a few changes. The third ODI will also be played at Pallekele on Sunday with the final two matches of the series being played at Colombo on August 31 and September 3. Having been whitewashed 3-0 by Virat Kohli's side in the Test series, many Sri Lankan fans made their frustrations known by blocking the team bus following the loss on Sunday and Tharanga will be hopeful that the team can produce a much-improved performance this time around. The Indian cricket team are on a splendid run of form though at the moment and it will take something special from the home side to stop the Virat Kohli-led juggernaut.